Editor’s note: We’d like to thank Matt Nafa for his coverage of Grand Prix Albuquerque, and hope to follow with more floor reports in the future. Hey guys! 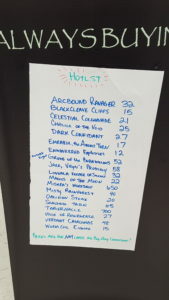 Floor reports have become increasingly popular and I noticed not as many #MTGFinance peeps went to Grand Prix Albuquerque as usually go to GPs so I took it upon myself to write this! 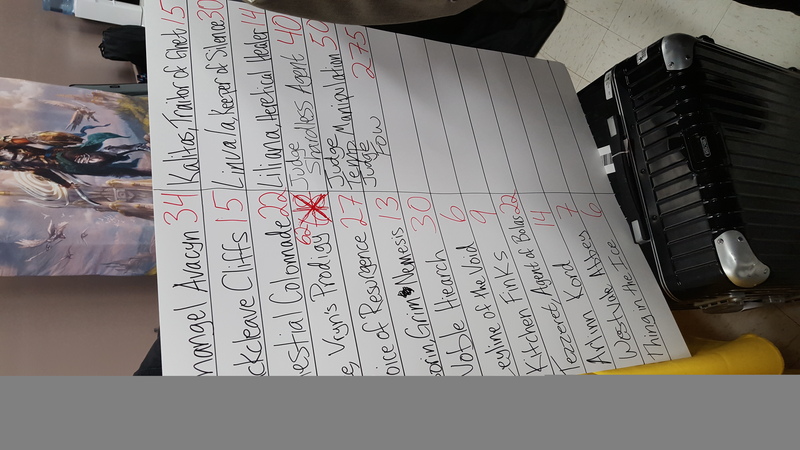 GP Albuquerque was a great event to go to if you were looking to play some Limited Magic with Shadows over Innistrad. The same may not be said for the weekend of trading. Since I wasn’t trading, I had a lot of time left to myself to walk around. I gathered a ton of information. 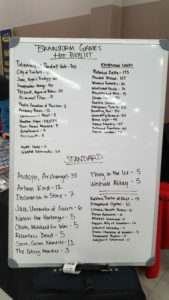 The vendors were out in force and looking to buy, with great buy prices on a lot of modern cards and standard alike. Nine vendors at the event meant a lot to see and a lot of research to be done. Let’s jump into it! The first table you saw walking into the room, accosted by their bright yellow table cloths and just past the score keeper stage. MTG Deals may have not always been a big name in GP vending, but they have decided to make a change to that and a change they have. Appearing at quite a few events these days they usually run a pretty tight ship and have very competitive prices, and this weekend was no different. 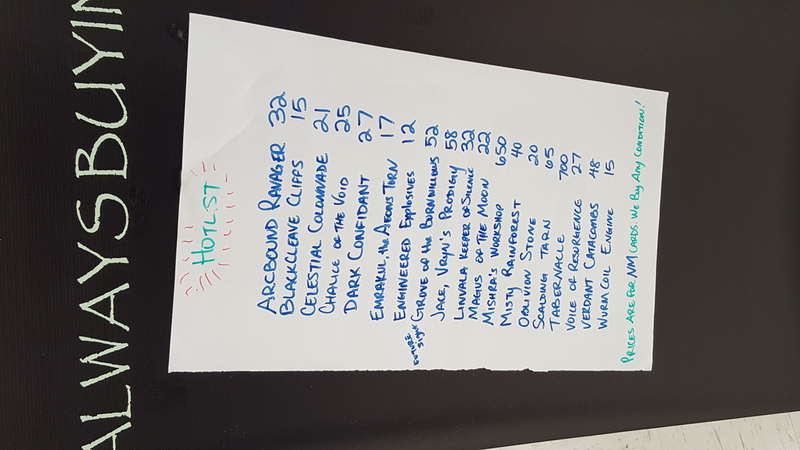 They had the highest buy price on Jace, Vryn’s Prodigy at $68, and among other notables they were also buying Voice of Resurgence at $27, Linvala, Keeper of Silence at $30, and Noble Hierarch at $30 as well, buy prices either the highest or tied for highest in the room. 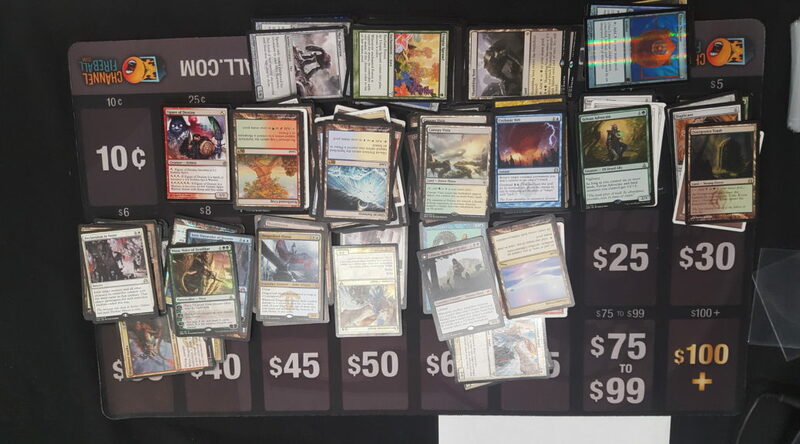 They left the played case at home this time in favor of bringing staples from Legacy to Standard, both foil and non-foil, and they had quite the foil case! They had some crazy low prices, almost everything in their case was priced to sell and the crowd in front of them surely showed it. 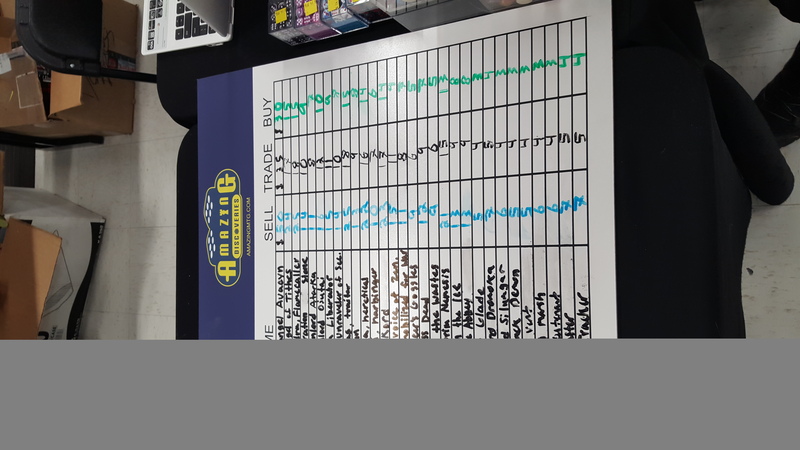 Between rounds and on Friday there were at least five people browsing the case at a time, many stopping to hand an employee money for around TCG Low on most cards. I was on the hunt to grab some playmats as a collector and for some friends back home, and when I asked about it I was given the personal number of an employee and told to text them periodically to see if they had bought some mats for me to purchase. 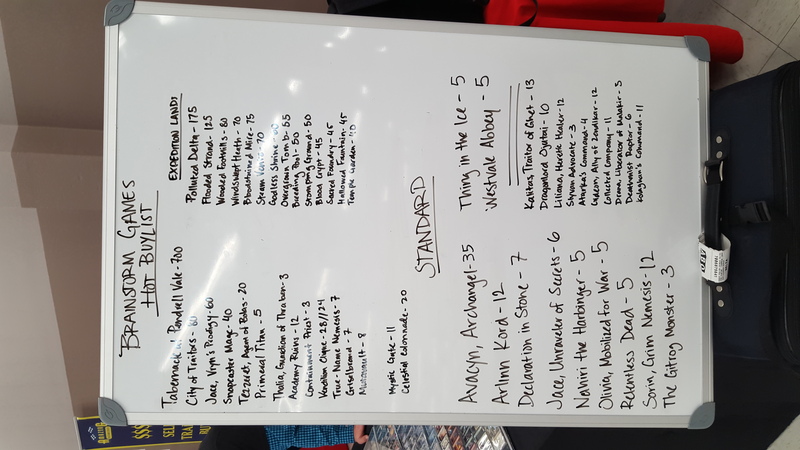 This was also the booth that multiple different vendors stopped by to check buylists, and change prices accordingly (Tales of Adventure sent over people multiple times). I was able to buy a set of World Magic Cup Qualifier Thalia, Guardian of Thraben at $35 and walk over to another vendor to sell them at $40. Who doesn’t love some good ol’ arbitrage? As good as MTGDeals was, one of my biggest problems of the GP came from them. I was waiting behind a store owner who was selling the bulk of his magic supply. I’m talking four full binders, five small 2×2 binders and a box of high end cards. Because of the swarm of people MTG Deals had only one buyer and it was the owner himself sitting down to buy cards, I waited in a growing line for two hours. And then I noticed another person waiting to sell had been seated at another table attached to the adjacent Dex Protection space and an employee from MTG Deals was buying from him. I waved down another employee to let him know that I had been waiting and was not with the man currently selling and I should be next in line. I then watched as another two people were seated to sell cards while I still waited. It took over two hours for me to finally sit down and sell cards. Thankfully I will say that the owner was very apologetic and extremely nice about the whole ordeal. He didn’t mind chatting with me while he pulled cards out and bought everything I expected him to without a hassle, and though it was worth the wait I did feel a bit slighted watching multiple people essentially cut ahead of me. Overall I would say I had a great experience with MTG Deals minus the little hiccup. Being from Texas and having only attended GPs within that general area before this, I had never had a run-in before with Brainstorm Games. They had a lot of smiling faces and were very approachable. Despite the smaller booth they definitely had a lot to offer, showing off many foreign foils, and foreign cards in general. They did not have the best prices but were able to be talked down to some degree on most things. 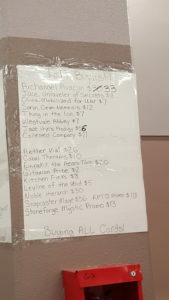 This is where I ended up buying the bulk of a legacy Death and Taxes list after haggling with the owner on many prices. Overall things went smoothly purchasing cards from them and I was able to leave happy. I did not sell anything to them though as their buy list prices weren’t close enough to my asking range. They also had a few foreign Mirrodin Besieged-era boxes that were quick to sell. I have seen these guys at a few events, but they never seem to have the highest buy prices on cards I am looking to sell. Nor do they have great sell prices on random cards. Rather than having a row of cases they show up with a shelf of 5k’s. There is something to be said about them having just about any card if you are willing to pay their asking price [Editor’s note: can confirm this was great]. A lot of their prices are firm on many things, however they do have a played or signed case that they usually show up with and a hefty supply of recent foreign product and more accessories than you could imagine. Their buyers were always busy however with someone in front of them. I imagine it was due to their Standard buy prices on Friday being so high, but those quickly came down by Saturday afternoon. They were paying the highest on playmats however, at $10 and selling them at $20. I had never seen these guys before, like I said. They had a moderately sized table at the back of the room right underneath a Jace banner from the venue. Their own personal banner was larger though. Their prices on some things were quite odd, however they had quite the collection of older cards and had them very accurately priced. No one batted an eye when I very thoroughly inspected some dual lands before purchasing them. Additionally, their playmat game was on point, with very competitively priced popular playmats such as Delver of Secrets from GP Tacoma and a Christopher Rush playmat with some hand drawn Lotus art added to it. They also had some adorable hand-drawn tokens up for sale, as well as a free lifepad with any purchase. That being said, their lack of any sort of written buylist and strange pricing did drive me away from buying anything else. I feel there might be some stigma against the big dog in the room, assuming that their buy prices are going to be lower than anyone else’s — and sometimes that is true, though not always and not in this case. They had one of the largest tables at the back left of the room. 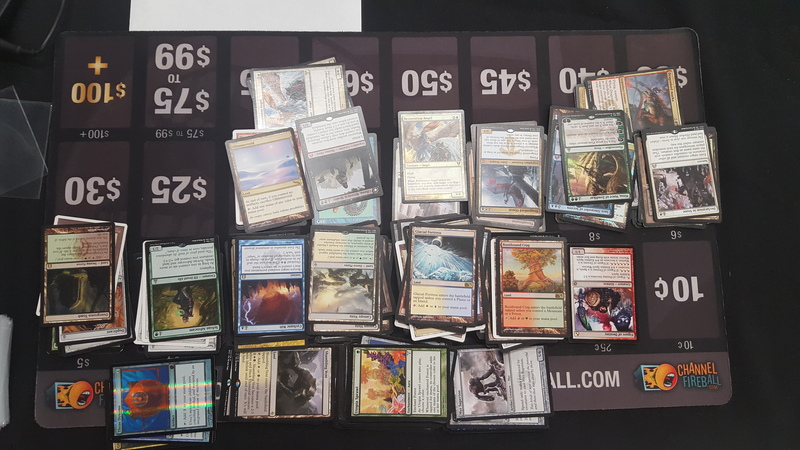 With my research done ahead of time and reinforced by their paper buylist at the venue, I was ready to sit down in front of my favorite buyer at the venue and catch up since we had last seen each other at GP Houston. I made sure to start with telling him there is still a standing invite to meat on swords (Brazilian Steakhouse), what has now become a GP tradition. He went through the usual of pulling cards out of my binder and I won’t bore you with the yes-no details. He was always very upfront on why they were buying at what price and what they sold them at and my numbers worked out. I sold off over $500 worth of items to Channel Fireball and sat in the chair for around an hour making small talk. I left a happy customer confident in the decisions I had just made. On their retail side, things were a bit odd but expected. All Standard cards were still at presale prices and they were shying away from paying too high on buylist for most things in Standard. The prices on Legacy staples were priced to sell however, with duals at close to prespike prices: Tundras were $180 when they were $230 at Houston, the same spread for the rest of the duals and it was a bit off-putting. I didn’t spend much money here except for taking home two boxes of CFB Ultra Pro sleeves. For some reason they are a hit amongst my playgroup and I got a good enough deal on them from the manager of the booth. With a table that could rival CFB but slightly less organized, Tales of Adventure showed up at yet another GP. You seem to see these guys everywhere “Buying Pokemon to Power” as they like to say. This time they were buying a humble amount of cards at very reasonable prices, but also had a paper buylist ready to go Friday morning. I sat down to sell a few cards I had replaced with foils and had a pleasant experience. I was helped right away, as it looked as if they had been very light on people selling to them — their prices may not have been competitive enough for the room they were in. They did, however, have a lot of great foils, and good enough pricing on many staples. They also brought along a huge selection of playmats, which didn’t surprise me (they are usually my main competitor with playmat sales on eBay), as well as the usual happy-to-help smiling faces you come to expect from someone who has been at this as long as they have. 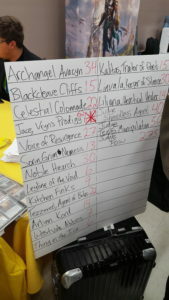 They didn’t get up a buylist until late Friday and by that point everyone had made their way to other vendors to sell. However these guys did have a nicely sized table with lots of pretty cards in their cases. 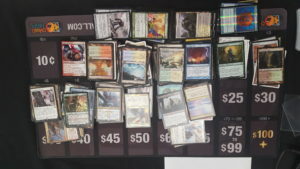 They laid out a not-so-humble foil selection and quite a few legacy and vintage cards. 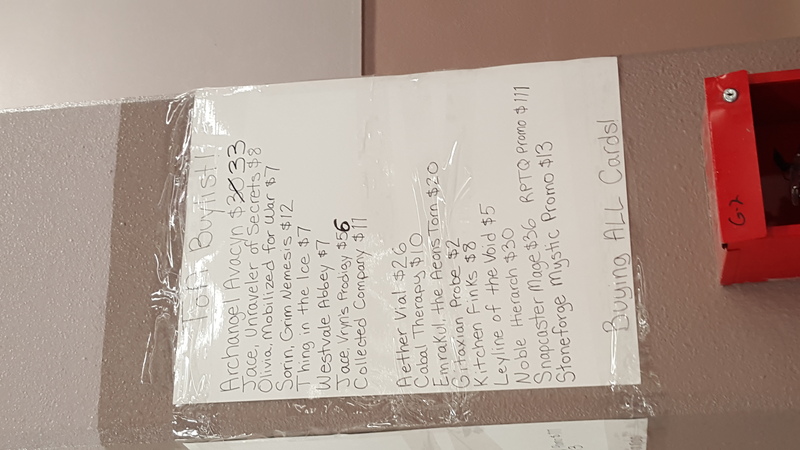 Their prices weren’t the most competitive but they were one of the few vendors in the room with the kind of card selection they were offering. I did not spend any money here as I was not in the market for power and would have liked to get things a bit cheaper to help along my margins. I would like to hear how their weekend went as most of the time it looked as though it was employees sorting cards, and waiting to help someone. This is another big store that had higher-than-necessary prices on most cards. They did not need to be as competitive with others due to taking the SCG approach. That’s not to say the employees weren’t friendly or that they didn’t have an amazing selection of cards. But they are definitely an online giant and act like it. They did not deviate from their printed and online buylist all weekend nor did they change many prices in their case. Not a stranger to GP’s but definitely an odd one to see. The booth was run most days by a one-man team but I believe there was another employee hiding behind their wide sign. These guys had a prime space at the front of the hall on the far end. And they looked to be quite busy. This was the only seller in the room with WMCQ Thalias at $60. They also didn’t have the greatest buylist on many cards so the only thing I sold to them were Thalia’s. They did have some attractive cards in their case and some good pricing but I didn’t spend any money here. I feel like something needs to be said about Cascade Games as the tournament organizer for this event. And it is that they did a fantastic job. They started off Friday morning with an entirely free Mini-Master, anyone was allowed to play in it as a thank you to maxed-out attendance. They ran multiple Friday morning events. I played in one, other friends played in several. I traveled up to New Mexico with a group of judges and heard a lot about behind the scenes with Cascade. From what I heard and what I saw they handled the event phenomenally. When the main event sold out they made accommodations including hiring more judges last minute, adding a Saturday morning event that was as much value as the main event at half the price. The only catch was you weren’t playing for anything more than prize tix, but to the people I saw in that room playing that was all that mattered to them. They paid $40 for a playmat, a promo, and six packs and to a lot of them that was more than enough; the prize tickets to them were just an extra bonus. They also opened two more ballrooms for the venue to put On Demands and the Saturday Morning Special in as the main event hall was full to capacity. Cascade handled any issues that arose very professionally. 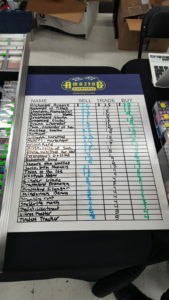 Their prize wall was stacked with great prizes from UltraPRO to Dex Protection. The only complaint I can imagine is that the chairs in the venue weren’t the best, and side events were cash only. There were a few scheduling errors but they were handled as best as they could be. I would love to return to a Cascade Games event and hope that they continue to run GPs close enough for me to attend. A good read thanks for writing. Also thanks for writing about a TO doing things right. For events of this size, I expect there will always be hiccups and I find the magic community to be extremely critical of the smallest of mistake. Some positivity is a welcome change. These are great to read, ty for sharing.